Functional Safety Engineering Processes: not a burden but a benefit. Altreonic is speaking at Flanders Drive' seminar on Functional Safety Engineering Processes: not a burden but a benefit. Eric Verhulst, CEO/CTO of Altreonic will open the seminar by putting the concept of safety engineering in a wider perspective under the title "Zen and the art of safety engineering". The perfectly safe car could be the one that doesn’t move. Clearly, more will be needed to make such a Panamarenko car acceptable as a real car. What is needed is a total concept of Trustworthiness. The trust that it works as advertised means not only good systems engineering but also that it works as advertised under all circumstances. Albeit an important one, safety is just one of the required system properties. Thursday, 29 April 2010 from 9.00u-18.00 hrs. 3. Network further and meet Altreonic at the Artemis event. The ARTEMIS-JU Information Day Call 2010 which will take place from 1 March 2010 until 1 March 2010 at the Congress Cente Nuremberg Ost, Nuremberg, Germany. We will be looking forward for your participation. Altreonic NV is an innovative SME focusing on the embedded market with a unified methodology for developing trustworthy solutions. 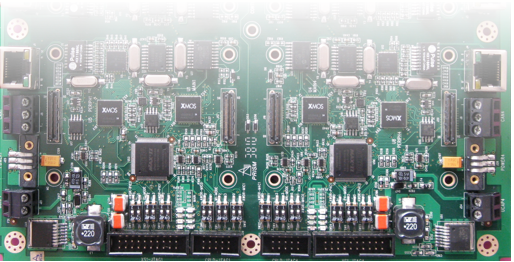 Based on a long experience since the late 1980's, custom engineering services are enabled by in-house developed tools to facilitate an integrated approach in particular for scalable and safety critical embedded software and hardware. The in-house development technology is also made available through a unique Open Technology Licensing model. OpenComRTOS: development of a novel real-time operating system using formal methods. This is still the core RTOS kernel now developed into VirtuosoNext Designer. ASIL: a Flanders Drive project to develop a common automotive safety engineering workflow. EVOLVE: an EU ITEA project on Evolutionary Verification and Validation of software. CRAFTERS: an EU Artemis on developing novel solutions for many/multicore systems. OPENCOSS: an FP7 IP project focusing on reducing the cost of certification. COMPACT: a regional project on reliability of electronics. NoFIST: a EUROCPS project with Thales on porting VirtuosoNext to a mixed criticality platform. Altreonic is a regular speaker at international conferences and workshops. One of the the core product of Altreonic is VirtuosoNext Designer, a unique formally developed network-centric real-time programming environment. VirtuosoNext Designer supports from small microcontrollers to multicore CPUs and networked distributed heterogeneous systems with a very small code size in a topology independent way. The latest release supports fine-grain space and time partitioning, reducing security and safety risk to a minimum. Current targets supported are ARM Cortex M3/M4/M5/R4/5R, A9, ARC, Freescale PowerPC, TI C66xx DSP, Leon3, MicroBlaze, XMOS, CoolFlux, Win32 and Linux. VirtuosoNext runtime code is mostly generated from the Visual Designer (Visual modeling and simulation environment). It supporting VirtuosoNext application development from single processor, over multicore to multi-processor heterogeneous target systems. By design it allows to cross develop on a PC, develop a simulator and generate then runtime code without modifying the source code. GoedelWorks: based on an internet portal, it support safety critical projects from early requirements capturing till final code generation. EventTracer: a graphical tool to visually display execution schedules on a multiprocessor target. Safe Virtual Machines for C.
Unique is the support for a Safe Virtual Machine that only needs about 3 KBytes. It allows to run binary compiled C code on any processor. GoedelWorks is the web based project support environment for supporting projects from early requirements and specification capturing till product release with an integrated safety standards knowledge base. Altreonic is using its own methodology and tools to develop a scalable and modular e-mobility concept code named "KURT". While used as a research vehicle, the aim is to spin it off as a commercial vehicle. 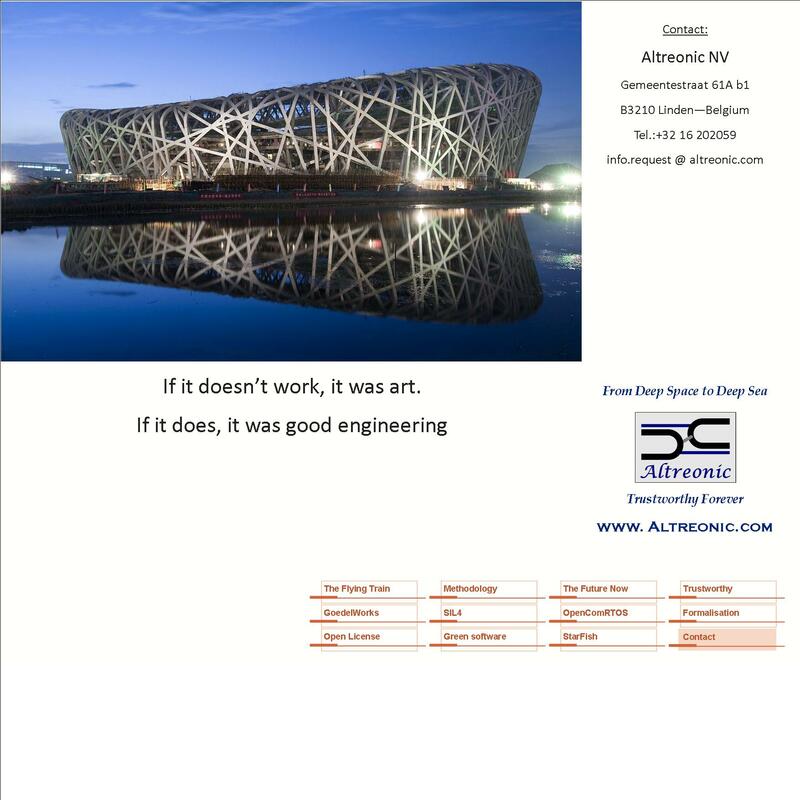 Altreonic's technology and products are available in a low cost Source code as well as an Open Technology License. Find our corporate brochure attached below. Or go to the on-line version here. This year the formal community met in Eindhoven (see FM week) . It was a unique opportunity as it brought together specialists from all over the world. It was also one of the first times that several complementary groups held their conference at the same location and in the same week. Altreonic had a well received paper at CPA ("OpenComRTOS: A Runtime Environment for Interacting Entities", see attached pdf). Formal methods are becoming not only mainstream but also a prerequisite in any development that has safety or security requirements. 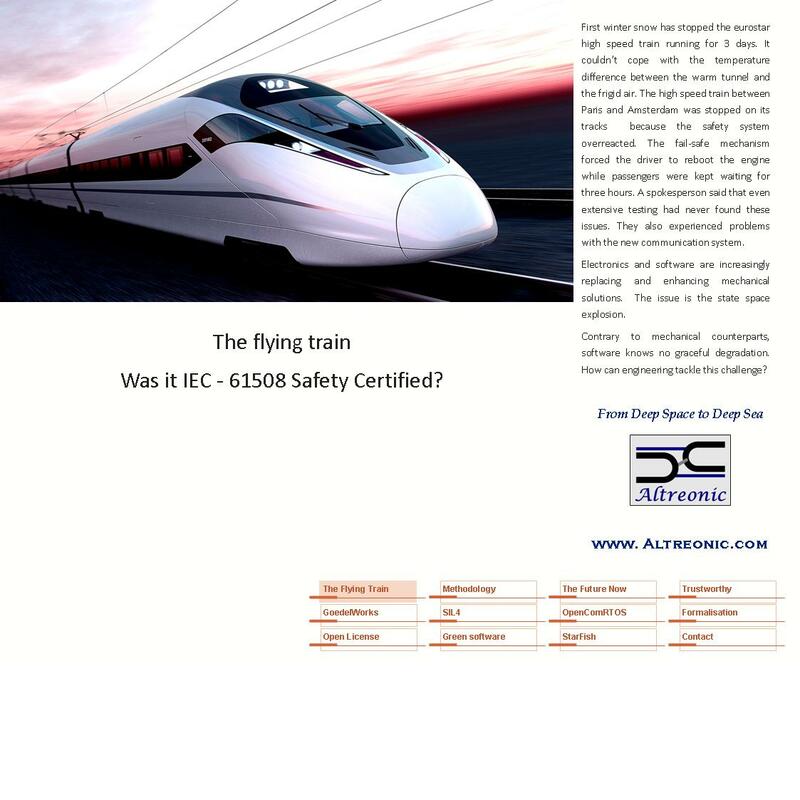 This is now clearly reflected in the recent versions of the IEC61508 and DO-178 safety standards. An interesting keynote was given by Jeannette Wing, professor at Carnegie Mellow and Assistant Director at the US National Science Foundation. While the topic was "Formal Methods for Privacy", she addressed the definition of what is meant with trustworthy systems very well. Simply said: Trustworthy = safety + security + privacy + usability. Altreonic has joined the DSP Valley cluster organisation. DSP Valley is a technology network organisation, focusing on the design of hardware and software technology for embedded processing systems. DSP Valley groups over 50 members that include universities, research institutes and industrial companies. The next even organised by DSP Valley is a Business-to-Business (B2B) Matchmaking Forum on Tuesday December 3th, 2009 at Sportoase in Leuven (Belgium).